The technology behind them is fairly simple. Each Grey Shark is a refillable helium balloon that receives commands from an infrared remote. The user's input via this remote controls both a tail motor and an adjustable weight. 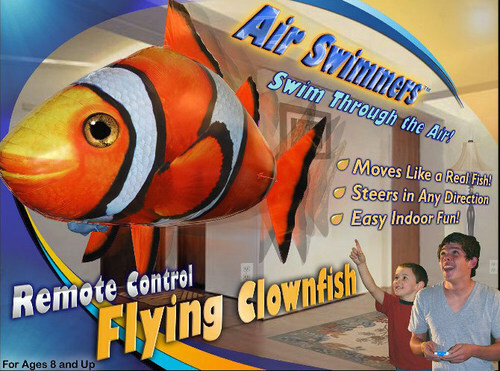 The tail fin motor can vary its flapping rate and range of motion to direction, while the adjustabe weight uses a motor to slide along the length of the Clownfish's underside, thereby controlling tilt. All you need to do is provide a helium fill-up and fresh AAA batteries prior to use.